Garson, G. D. (2016). Logistic Regression: Binomial and Multinomial, 2016 Edition. Asheboro, NC: Statistical Associates Publishers. 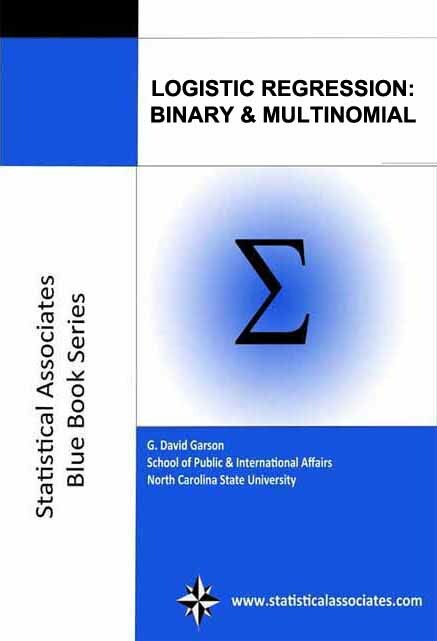 An illustrated tutorial and introduction to binary and multinomial logistic regression using SPSS, SAS, or Stata for examples. Suitable for introductory graduate-level study. Topics include binary, multinomial, conditional logistic models; stepwise logistic regression; ROC curves; interpretation of odds ratios, logit coefficients, significance; bootstrapping and jackknifing; assumptions; FAQs; and much more.